First Line: Yes, this was her house, many years ago, when she was still Xenia. In 1736 when Dasha was only four, a horrible fire destroyed the house of her father's cousin, and the cousin's wife and two daughters, Nadya and Xenia, came to live with them. As they were members of the minor nobility, it was important for everyone in the family to dress in the right clothes, attend all the right functions, and know all the current gossip. Nadya fit into this world. Dasha and Xenia did not. In an age when it was frowned upon for women to know how to read, Dasha was drawn to the printed page and punished many times for trying to sneak into her brother's lessons or trying to teach herself to read. Dasha did not fit in. Neither did Xenia. Xenia always seemed more deeply attuned to the world around her-- the sights, the sounds, the emotions. She grew up to be a dreamer who cared little for social conventions, and who was deeply in love with her husband, Andrei, a soldier and singer in the Empress's Imperial choir. Only one thing could make Xenia's life complete: a child, and when she gave birth to a daughter, her joy knew no bounds. But her happiness was not meant to last. Tragedy upon tragedy strikes, and a grieving Xenia withdraws from the world. When she begins turning away from family and friends, when she begins giving away all her money, clothing and possessions to the poor, the rich point and whisper... and the poor begin to revere her. Little is known about Xenia, patron saint of St. Petersburg and its poor, and this gives Debra Dean the perfect canvas upon which to create another wonderful portrait of Russia. 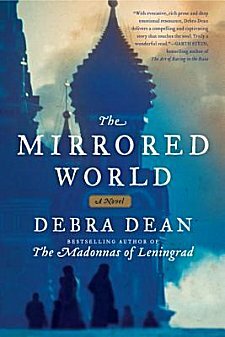 Her The Madonnas of Leningrad was one of my favorite books the year it was published, and I had high hopes for The Mirrored World. In almost every way, I was not disappointed. If you expect this book to be a deadly boring portrait of a saint, you're the one who's doomed to disappointment. This story is told by Dasha, the little girl who insisted upon learning to read. She grows up to be an intelligent, observant woman who-- like Xenia-- doesn't particularly care for the excesses of the society in which they live. Xenia disappears for a period of several years, and it is up to Dasha to make her own life while remembering her lost friend. Dean is a master of creating layer upon layer of mood, and she's done it again here. The longer I read, the more I disagreed with what the synopsis of the book had told me. According to it, The Mirrored World is all about Xenia, Xenia, Xenia. It's not. How could it really be when Dasha tells the story from beginning to end? No. Dean's lyrical, atmospheric book is the tale of Mary of Bethany and her sister, Martha, set in the extravagant, feckless Russia of the eighteenth century. After a bit of a slow beginning, the book rapidly gains power and intensity through to the end. Earlier I said that I was pleased "in almost every way." In which way was I not pleased? The book was too short... although there is much to be said for a writer who leaves you wanting more. Thank you for those kind words, Kay! If you loved Madonnas, you should enjoy Mirror. It's nice to see the author didn't let you down. I don't read much historical fiction but do enjoy that time and place. I've had a thing for Tsarist Russia for a very long time. Cathy - I'm already drawn in just by the character of Dasha. And what a great historical setting too! I'm very glad this one was as good as you were hoping it would be. I hope you enjoy them-- especially Madonnas! I haven't read many books set in Russia - but this one sounds beautiful! It is. Russia-- especially Tsarist Russia-- is a love of mine. I've heard wonderful things about The Madonnas of Leningrad! Glad to hear that this one doesn't disappoint! It's not as good as Madonnas, but since I think Madonnas was superb, it still means that Mirror is very very good! I haven't read many books set in Russia but this sounds very interesting. Maybe I should give this a try. Thanks for the review! If you only have time for one, I would suggest The Madonnas of Leningrad. That is a splendid book. This seems like a departure for you, Cathy, but it sounds wonderful to me, as does the earlier book. I love stories set in Russia. On the list both of them go. It's not really a departure. I've loved books about Tsarist Russia for most of my life, but I will admit that it is a departure on this normally mysterious blog! I really liked The Mirrored World (review to appear on the AudioFile website) and found the story fascinating. I hadn't know anything about Xenia before and I like Dasha's take on Elizabeth's court. I don't think a series set in tsarist Russia is for everyone. Certainly not for me. My grandparents fled in 1907, as Jewish people were victims of tsarist-led anti-Semitic pogroms for years. Also,the borders of their homeland, Poland, were obliterated by imperial Russia, which incorporated Poland and other countries into their empire. I know this isn't pleasant to bring up but those were the realities faced in those days by Jewish and other peoples. Also, Jews were forced into the tsar's army for 25 years; many fled to avoid what was basically forced labor under brutal conditions. You bring up some very valid points, Kathy, that I am well aware of, but others may not be.